Welcome to the Ultrasound Leadership Academy (ULA) summary blog series. This week, we discuss central venous catheter placement. The ULA is essentially an online advanced ultrasound education experience put on by the team from Ultrasound Podcast which brings cutting edge learning to emergency medicine personnel through a variety of interactive platforms including video lectures, google hangouts with experts, simulation, live conferences and real time scanning with a pocket-sized ultrasound device known as a Vscan. Prior to reading this post, I suggest you review our previous post "Introduction to Procedural Ultrasound" if you are not familiar with ultrasound guidance terminology and basics. If the past few posts on procedural ultrasound haven't convinced you already on the significant benefit of ultrasound guidance for procedures then I hope that this post will finally put this matter to bed. Today we are talking about ultrasound guidance in central venous cannulation (CVC). While once a procedure based on anatomic landmarks, it has now essentially become standard of care to perform CVC under direct ultrasound visualization. Not only has it lead to higher success rates, it also is cheaper, results in less complications and less infection. Did I mention it is faster as well? Let's get into the learning. Large vessels of the neck. Short axis view along the right IJ with the probe marker towards the patient's left side. The internal jugular approach is an excellent site for cannulation and our go to for most central lines. It has a low risk of infection and anatomy is fairly straightforward. The IJ lies lateral to the carotid artery, below the SCM muscle, and is generally more ovoid than the carotid. Short axis view of the left common femoral vein (CFV), saphenous vein (SV) and common femoral artery (CFA). From Emergency Ultrasound Teaching. The femoral vein is generally an easier site to cannulate and there is less surrounding high risk territory. Remember from lateral to medial the mnemonic NAVEL (femoral nerve, femoral artery, femoral vein, empty, lymphatics). This was once thought of as a line with higher rates of infection however a recent review by Paul Marik found no difference in catheter related blood stream infections with this line compared to IJ or subclavian. Check this paper out here. 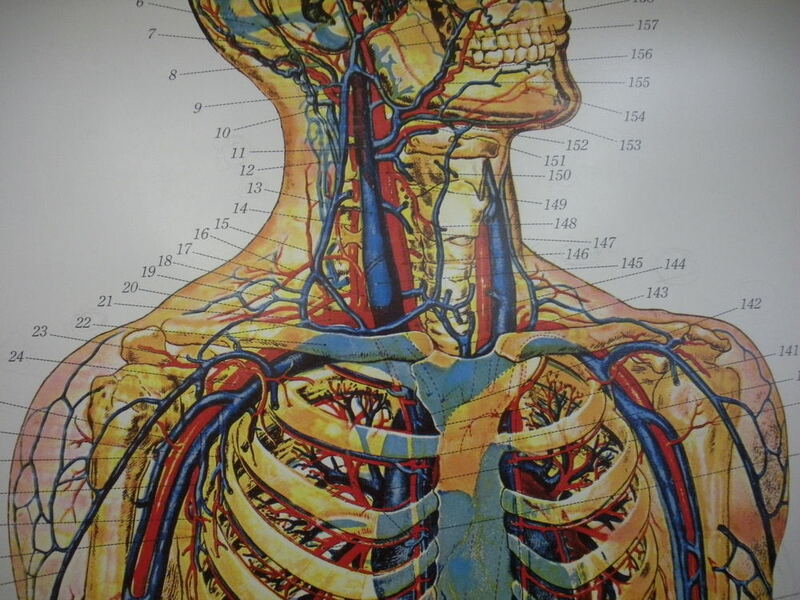 Arteries and veins of the upper body. 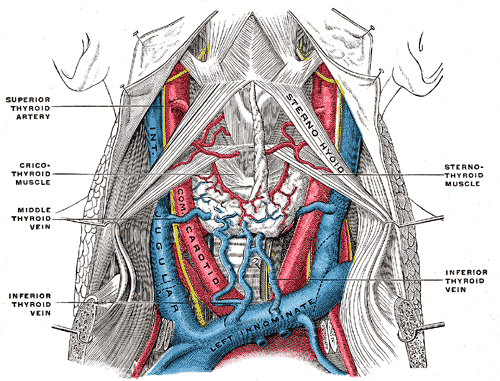 Note position of subclavian veins relative to the clavicles. Short axis view of the subclavian, just lateral to the head of the clavicle. Seen here is the clavicle to the left of the screen, the subclavian vein (SV) anteriorly, the subclavian artery (SA) posteriorly, and the lung at the base of the screen. From Sonosite Youtube page. The subclavian vein approach is a more challenging one. While initially taught as a landmark only approach, studies using ultrasound show that the rate of success is much higher and complication rate significantly lower. Note that the subclavian veins run under the clavicle at approximately the junction between the proximal and middle third of the clavicle and is anterior to the subclavian artery at this point. This will likely be situation dependent. For example, if your patient is in a c-collar or has a very short neck, you may want to avoid the internal jugular. Or if it is a crashing patient, the femoral vein might be ideal since it requires less set up time and is technically easier to cannulate. The subclavian approach is an excellent line but probably should be performed once you have a bit of experience with ultrasound guidance under your belt. Evaluate the vein with ultrasound. Valsalva: Have the patient bear down. This will increase intra-thoracic pressure, decrease venous return, and therefore plump up your vein as you are viewing it under ultrasound. Augmentation and Doppler: You can turn on color doppler to assess flow through vessels on your screen. The artery will have a pulsatile flow pattern while the vein will appear as more of a mosaic, continuous flow. If you are having trouble seeing flow through the vein, try squeezing the extremity distal to your vein (augmenting the flow) and you will see increased color through the vein. Proper sterile technique is of upmost importance when placing a CVC as blood stream infections are not uncommon. Complete surgical prep is necessary including a full surgical sterile drape, full personal sterile equipment and proper prep of the patient with chlorhexidine. You will also need to use a sterile ultrasound probe cover and sterile ultrasound gel packet. As you know, placing the sterile US probe cover can be tricky if your alone. Refer to our previous post on how to prep for sterility, as well as how to properly set up your US machine. Dynamic ultrasound guidance for placement. The argument for short axis versus long axis technique for CVC placement continues to wage on. Many ultrasound operators prefer the short axis view as they are most familiar with this technique and initially it requires less dexterity. However the long axis view provides better full needle visualization as it enters the vein lumen. A recent study that was just published, looking at long axis versus short axis for IJ & subclavian CVC placement, found that the long axis view was more efficient and required less redirection for internal jugular cannulation. It also found that during subclavian CVC cannulation, there were fewer posterior wall penetrations. That being said, it seems that long axis should result in fewer complications such as arterial puncture or pneumothorax, though this really has not been confirmed in a solid study. Ideally, you really should be familiar with both approaches. Once you are familiar with ultrasound guidance for procedures, the technique for needle guidance and cannulation is similar across the the various central venous access points other than anatomy and probe placement. The Sonosite videos for internal jugular, subclavian, and femoral CVC cannulation are excellent for this purpose and are only 1.5 minutes each. They demonstrate the short axis technique however long axis would only require rotating the probe 90 degrees while directly over the vein. Check out each of these for proper probe placement and pertinent ultrasound anatomy. Once you have viewed these videos and are comfortable with the ultrasound anatomy, you can review this lecture at Emergency Ultrasound Teaching to solidify technical understanding of short and long axis approach further. Confirmation of wire placement. The wire is visualized traversing the soft tissue, passing into the vessel lumen and running along the back wall of the vein. From ULA Central Line Placement. Once you have accessed your central vein with your needle and have passed your wire, you now need to make sure you confirm that you are still within the vessel lumen. This is performed simply by placing the ultrasound probe back on the vein and visualizing the wire within the vessel lumen. This can be performed in either long axis or short axis, however the most important aspect of confirmation is to identify that the wire is running along the back wall and not simply passing through the back wall and into the soft tissue or into an artery. Be sure to follow the wire down until you can confirm this. After you have completed this step, it is all down hill from here. Continue with the remainder of your CVC cannulation procedure as you normally would. If you need to review the steps of a standard central line placement from start to finish, watch the NEJM procedure video here. Often you can ultrasound, find your vein of interest quickly and attempt to cannulate without actually using ultrasound dynamically but more in a static fashion. This is dangerous and puts you at risk of posterior wall puncture and complications. Be sure to follow your needle tip and all times. Whether you are following it down in short axis by fanning or sliding distally from the insertion site, or using the long axis view, the most important thing you can do is always know where your needle is at. Evaluate your vein of interest. Prior to even prepping you should always check the anatomy of the vein you are attempting to cannulate. Assess its location but also make sure that it is fully compressible throughout to rule out any clot that could potentially prevent placement of the catheter. You can increase the signal from your needle (it will appear brighter) by performing manual beam steering. This technique involves tilting the probe over the area of interest to make the ultrasound beams approach being perpendicular to the needle and increasing signal as seen above. An alternative approach to the infraclavicular approach, the advantages here include a relatively short distance to the vein and less wire kinking. Initially, it may be difficult to visualize your needle if performing a long axis approach. One technique you may find useful is known as the "Ski Lift" which involves manual beam steering as discussed earlier. This technique is described by Jason Nomura, at Takeokun.com, I suggest you watch his brief video here. More on procedural US can be found in "Introduction to Bedside Ultrasound," Volume 1 & 2, from Dr. Mallin and Dr. Dawson. If you are interested in purchasing these ebooks for less than $1, visit Ultrasound Podcast Consumables.